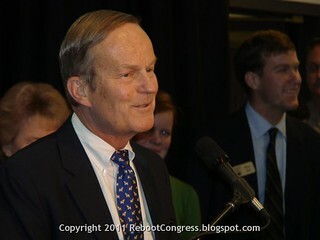 Reboot Congress: #MOSen: Did Phyllis Schlafly ask Todd Akin to step aside? #MOSen: Did Phyllis Schlafly ask Todd Akin to step aside? Schlafly’s appeal is part of a continued tack by Republicans, both nationally and at the state level, to gently nudge Akin out of the Senate race, even after initial appeals by party leaders failed. “I criticized his campaign, but in no way was that meant to urge him to get out,” she told The Post. “I was very critical of the staff and it was a strong statement to urge him to hire good people.” She added that she believed Akin was following her advice; he recently hired Rick Tyler, a long-time aide to Newt Gingrich. The meeting in question happened in Tampa, shortly before the Republican National Convention, during a conference held by the conservative Center for National Policy. Schlafly said that anyone who claimed she wanted Akin to drop out must have misunderstood. She noted that at the same event, she held a fundraiser for Akin’s campaign. Schlafly's certainly been supportive of Akin since this meeting at the Council for National Policy, so it would seem that something he said or did shortly afterward re-assured her.